In India, the percent of the black cotton soil found in total soil deposition is almost 15%. This type of land is found in many other countries of the world. Previously most of the Indian farmers grew cotton in black soil. Black soil is very much favourable (good fertility) for producing the plant of cotton and hence this soil is known as black cotton soil in India and south Asia particularly. Basically the black cotton soil has fine-grained clay particles which cause a massive change in volume with change in moisture conditions, i.e. it swells excessively when wet and shrinks during dry period. Hence black cotton soil is also known as expansive soil. Please note all black cotton soil is not expansive and all expansive soil is not black. It is the expansive nature of soil which is challenging and creates problems and not colour. Building a foundation in black cotton soil is a risk and to avoid the risk, read here which will reveal the mystery of foundation in black cotton soil. Why Foundation in Black Cotton Soil is a Risk? The shrinkage and swelling of black cotton soil has become a severe problem for the entire construction industry. The swelling and shrinkage of expansive soil cause the differential settlement of building. When dry, it is very hard, but it loses strength completely when wet. It therefore results in the development of the cracks in house. If the building settles more, then it may become the reason for the failure of a building or a house more particularly in case of load bearing structures. Hence it is necessary in such soils, either to place the foundation at such a depth where the effects of seasonal changes are not important or to make the foundation capable of eliminating the undesirable effects due to relative movement by either providing flexible type of construction or rigid foundations. Adequate load counteraction swelling pressures also provide satisfactory foundation. Thus, resting the foundations of the building on the black cotton soil is a very challenging job. Which Precautions should be Taken while Resting the Foundation on Black Cotton Soil? To read the following precautions with better understanding it is recommended to read the following 3 terms before reading the precautions. Before commencing the work at a site, it is good to evaluate the properties like swelling pressure, shrinkage index, consolidation (compressibility of soil) and strength of black cotton soil. It helps to ascertain the suitability of the soil or say black cotton soil for the construction of the building. Normally as per IS 1893:2016, when the N value of the soil at a particular level is less than 10 in Zone III, IV or V and less than 15 in Zone II, high rise building on such soils should be avoided or pile foundation or adequate soil stabilization should be done. It is the pressure which soil exert on the footing when the soil is not allowed to swell or when the volume change is arrested. It is the measure of the degree of the expansiveness of soil. Cracks are formed due to movement of the ground on account of alternate swelling and shrinkage. The cracks thus formed are sometimes 15 to 20 cm wide and 2.5 to 4 m deep. To avoid this, following precautions are generally adopted while building structure on black cotton soil. Following are the precautions which are same for both the RCC framed structure and load bearing structure. Here we differentiate the precautions for low-rise structure and high rise structure. 01. Provide spread footings/wall footings, under reamed piles or raft foundation (for special structure whose load is greater than 6 tone/sq.m) for the low-rise buildings. Never rest the foundation on the black cotton soil. Lay the foundation minimum 300 to 500mm below the level where the cracks cease in the ground. This is very important to assess on the site. 02. Provide minimum depth of foundation as per SBCand stabilize the soil if needed. Stabilization is the processes in which 5 to 7 % materials like lime, cement plant dust etc. are added to the soil which improve the bearing capacity of the black cotton/expansive soil. 03. Provide the RCC ties on the periphery of the building at plinth level, lintel level and roof level, particularly in case of load bearing structure. In case of RCC framed structure, the floor beams and roof slab with beams itself act as ties. 04. It is advisable to limit the whole load of structure on the black cotton/expansive soil to 5.5 tones/Sq.m. If groundwater finds access to the foundations, the limit of loading should be restricted based on its SBC. 05. If the black cotton soil is found in the top layers, say 1 to 1.5 m then entire soil should be removed, and foundation should be rested on hard firm strata of good soil. 06. Vegetation and planting of trees and shrubs adjacent to the building should be avoided. 07. Special treatments like horizontal and vertical moisture barriers should be provided to control the moisture movement within the depth of foundation. Some examples of the horizontal barriers are the surface sidewalk, paved or buried impervious membrane at the outer wall periphery Commonly known as “Plinth Protection” and vertical barriers include vertical trench about 15 cm wide by 1.5m deep which is filled with gravel lean concrete, or the mixture of granulated rubber, lime and fly ash. All the moisture barriers should be provided with an adequate drainage system. 08. Avoid the direct contact of the black cotton soil with the foundation, column, masonry work etc. as it will damage it. Hence it is necessary to prevent the direct contact of black cotton soil with masonry work below ground level. These can be achieved by making a trench around the foundation and fill the space with sand or moorum. Remember that the layer of sand or moorum should be well watered and compacted. 09. The bed of foundation trench should be made firm hard by ramming it well. On the rammed bed a 30cm layer of a good hard moorum should be spread in layer of 15cm, each layer being well watered and rammed before laying the next layer. On this layer either stone or sand bed should be provided to the desired height to place the foundation concrete bed block upon it. 10. It is also advisable to avoid backfilling of excavated black cotton soil in the plinth refilling. 11. In the case of load-bearing structure, the wall footing should be dug 40 cm wider than the width of the foundation. Provide at least 20 cm wide layer of coarse sand on either side of foundation to separate the substructure from having direct contact with black cotton soil and foundation concrete. 12. Provide the raft foundation for the important structures as it will help to float the building on the bed below. It is advisable that the raft foundation should be quite independent of the surrounding black cotton soil. 13. In case of less important structure like compound wall, width of a sand layer on either side of foundation masonry should be 15 cm. 14. The masonry for walls should be started at least 15cm below the natural ground level. 15. Construction in black cotton soil should be carried out in the dry season. 16. It is advisable to place the foundation at such a depth where the effects of seasonal changes are not important. Provide the flexible type of construction or rigid foundations to eliminate the undesirable effects due to the relative movement. Adequate load counteraction swelling pressure also provides satisfactory foundations. 17. Sometimes excavation for foundations in the water-logged black cotton soil becomes a big problem for the site engineers. We have already discussed different methods of dewatering to drain out the water. This system helps to control the water table and also helps to improve the soil bearing capacity. 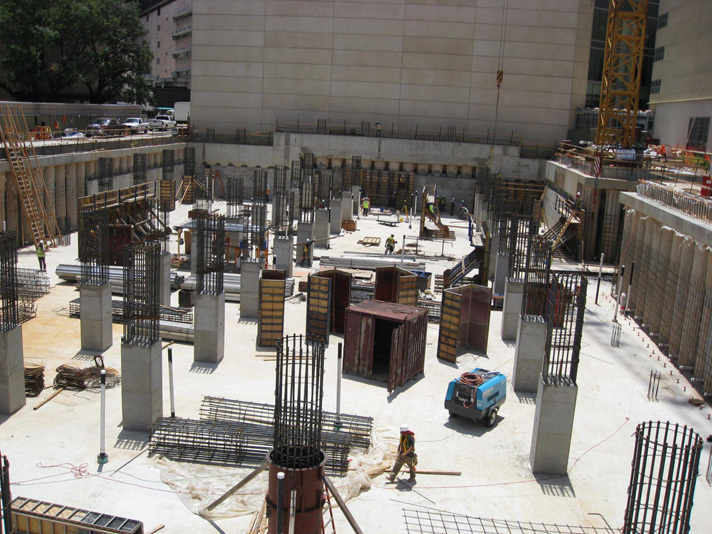 Provide raft foundation, under reamed pile, or pile foundation for the high-rise structures. It is advisable that the foundation should be quite independent of the surrounding black cotton soil as it will damage it. These can be achieved by making a trench around the foundation and fill the space of trench with sand or moorum or backfilling with yellow soil. Which Types of Foundation are Recommended in Black Cotton Soil/Expansive Soil? As far as the black cotton soil is concerned for single storey or double storeys building, soil stabilization will be useful. But for multi storey, or high-rise buildings or super high-rise buildings, the mat foundation or pile foundation are useful. What to do if good soil is not available say up to 5m? Normally foundations on black cotton soil are not advisable at all, both for load bearing or RCC structures. However what to do if good soil for laying the foundations is not available at a reasonable depth say 2.0 or 2.5m or 4.0m depth for single or double storey buildings. If the layer of black cotton soil in upper strata, itself is 3.0 to 5.0m or more, how deep one should go for small buildings or what type of foundations should be constructed in such a case and at what depth? Because if you go deeper and deeper, it will increase the cost of foundation. For low rise buildings, one may not go excessively deep. One can either do soil stabilization using various techniques or can use different type of foundations. In high rise building, one has to go for special types of foundation system. Foundation transmits and distributes imposed loads to the soil in such a way that the load-bearing capacity of the foundation bed is not exceeded. There are many types of footings which transmit and distribute the loads of building to the soil. Following types of footings are mostly used to construct building/house in the black cotton soil depending upon the soil conditions and load from the structure. Spread footings and wall footings are used where a layer of good soil (soil which is capable of supporting the load of the building or soil which has the sufficient load bearing capacity) is within 2m to 3m (6 to 10 feet) from the natural ground surface. Spread footings and wall footings should not be used where the high flow of the groundwater is found within the depth of foundation as it may result in scouring. However the soil bearing capacity must be adequate to support the weight of the structure. An under reamed pile is a pile of shallow depth (1 to 6m) having one or more bulb at its lower end. If this bulb is taken or provided at a level lower than the critical depth of moisture movement in black cotton/expansive soils, the foundation will be anchored to the ground and it would not move with movement (shrinkage and swelling) of soil. Hence when the ground has black cotton/expansive soil up to 1 to 6m, you can use the under-reamed piles (in situ concrete piles having bulk-shaped enlargement near the base) for the foundation of low rise building. It is the safest and economical option to construct the foundation in black cotton soil. In this type of foundations, the building or a house is anchored to the ground at the depth where the ground movement due to changes in moisture content is negligible. If the water table is high, bentonite slurry is used to retain the sides of the bore-hole against collapse. Based on research carried out at Central Building Research Institute Roorkee (India), the under-reamed piles are the ideal solution for the foundation in black cotton/expansive soil particularly for low rise structure. One can use one or more than one under reamed piles with pile cap for a column, depending upon the load on column. The mat foundation is suitable for black cotton/expansive soils whose bearing capacity is less for suitability of spread footings and wall footings. It is also recommended and or economical when the area of footings becomes greater than 50 percent area of the building. This is generally recommended for high rise buildings. For low rise building, it would be very costly. Mat foundation should not be used if high groundwater table is found within the depth of foundation as it results in scour and liquefaction may occur. The pile foundation is used to transfer the heavy loads from the structure to hard rock strata which is much deep below the ground level and where shallow foundations or mat foundation is not feasible due to weak or expansive soil in upper layer. The pile foundation also prevents uplift of building due to lateral loads such as earthquake and wind forces. Generally, the depth of hard rock strata may be 5m to 50m (15 feet to 150 feet) deep from the natural ground surface, depending upon local topography and geology. The pile foundations resist the load s from structure by skin friction and by end bearing. Uses of pile foundations also prevent settlements of foundations. You can use drilled shafts for the deep foundation of high rise building where the depth of hard firm strata below the ground is 10m or up to 100m (25 feet to 300 feet). Drilled shafts foundations are not suitable when deep deposits of soft clays and loose water bearing granular soils exists. It is also not suitable where carving formations are difficult to stabilize, I.e. soil made up of boulders and artesian aquifer exit. In conclusion, as the capacity (SBC) of black cotton soil is very low, say 4 to 6 tone/sq.m, resting the foundation on such soil is very dangerous for your building/house. Hence never provide foundation on the black cotton/expansive soil. Spread footings and wall footings should be provided where good soil is found within 3m depth, In case of structure with heavy loads, mat foundations should be preferred. You can also use under reamed pile when the black cotton soil is found up to 4 to 5m or prefer pile foundation/mat foundation when the depth of soil is more than 5m. It is always advisable to consult the structural engineer before you construct your house on black cotton soil. Previous PostPrevious What is Two-way Slab? Next PostNext Concrete Plasticizer: Achieve Workable Concrete with Less Water Content!